The game was a rout that surprised no one. Undefeated Hopkins, with a host of elite level players led by the No. 1-rated junior in the nation, Paige Bueckers, routed injury-riddled Holy Angels 87-43. Bueckers had 20, mighty-mite Dlayla (LayLay) Chakolis, the best under 6-foot interior player in the state, added 14 and the Royals put the game away early with a 30-0 run. After the game, Hopkins coach Brian Cosgriff talked about his talented young lineup and how it's caught the eye of University of Minnesota womens’ basketball coach Lindsay Whalen. Where former Gopher coach Marlene Stollings was nearly non-existent in high school gyms around the state and didn’t prioritize the recruitment of local players, Whalen has made it a priority. Among the Minnesotans to whom she’s extended scholarship offers, three play for the Royals: Bueckers, considered the top recruit in the country in the Class of 2020; freshmen Maya Nnaji, a 6-2 post, and Amaya Battle, a smooth 5-11 point guard. Cosgriff said he expects a fourth Gophers’ offer to come soon for 5-11 eighth-grader Taylor Woodson. So far, Cosgriff said, so good. He’s impressed by the commitment the staff has made toward recruiting Minnesota kids. Stillwater guard Sara Scalia signed with the Gophers’ last fall. He expects more to follow suit. The Gophers’ recent slump, having lost five of their last six games after a 12-0 start, doesn’t concern him in the long run. Holy Angels, which entered the game ranked No. 3 in Class 3A, played with a marked disadvantage, made more pronounced because of the opponent. The Stars were without sophomore Frankie Vascellaro, who tore a ligament in her right ankle in their previous game against DeLaSalle and sat on the Holy Angels bench with a walking boot on her leg. They also lost sophomore forward Rachel Kawiecki, the team’s second leading rebounder and a force in the lane, to a left ankle injury suffered in practice Friday. The versatile 6-foot tall Vascellaro has been having a breakout season, leading Holy Angels in scoring and rebounding (21.4 points, 7.5 rebounds per game). 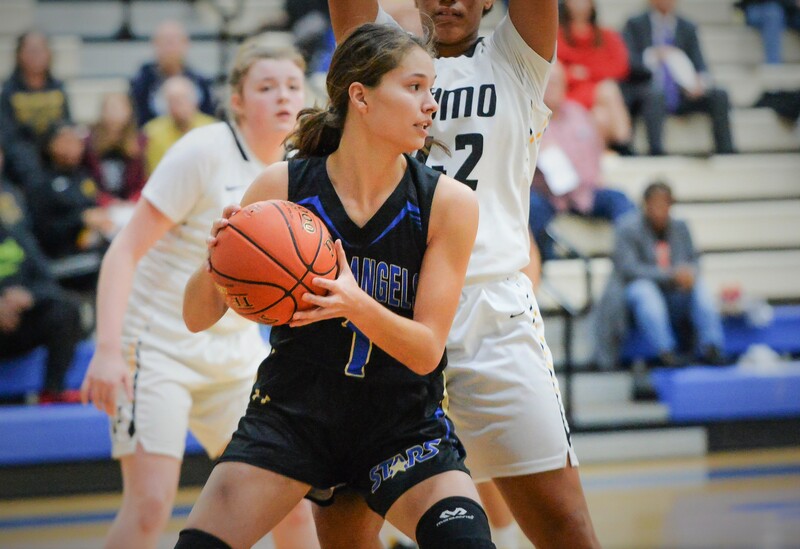 She’s also been vital in helping the Stars retool their offense since the transfer of two of their top players from a year ago, Destinee Oberg (Bloomington Kennedy) and Kaylie Vanderwerf (Burnsville). Once a team married to half-court sets, Holy Angels has adopted a more up-tempo style. “It’s kind of allowed us all to be a little more free and play the whole court,” said Vascellaro, shown above in a game earlier this season. The hope for Vascellaro’s injury is a return in four weeks, just in time for the section playoffs, but nothing is certain. She’ll know more after a doctor’s visit next week.